Along with constructing buildings for the station, work on layout wiring and control for the front two modules is well underway. The CBUS layout control bus system, provided in kit form by the Model Electronic Railway Group (MERG) in the UK, was chosen for the capabilities it can provide, the reduction of wiring it offers, and the ability to configure the operations of the layout from a computer. The CBUS system uses the Control Area Network (CAN) bus, developed by Bosch for use in motor vehicles. The two-wire CAN bus is used to communicate information all over the layout. Messages are transmitted between circuit boards, sending "event" messages from any one board to all the other boards. The boards are configured over the same CAN bus through a computer program and a USB adapter. The configuration involves mapping actions of inputs to actions of outputs. Any wiring for inputs and outputs is local to each board, avoiding long runs of cables - say between switches and devices - as the two wires of the CAN bus sends the information needed from any input to any output, no matter where they may be located in the system. During normal layout operations, CBUS boards generate "events" when something happens, for example when a train is detected on a track. The board connected to whatever happened creates a message for that event, which is transmitted on the CAN bus. The other boards receiving this event will look at it and perform any actions that they may have been configured to do for that event. To use a storage yard track as an example: when a pushbutton wired to a switch input board on the front module is pressed, the event for that pushbutton press is transmitted. All the other boards receive the same event message. The point motors wired to a number of output boards on the rear storage yard modules move, aligning all the points for that track. At the same time, the indicator LEDs on the front and rear control panels change to display the storage track that was chosen. 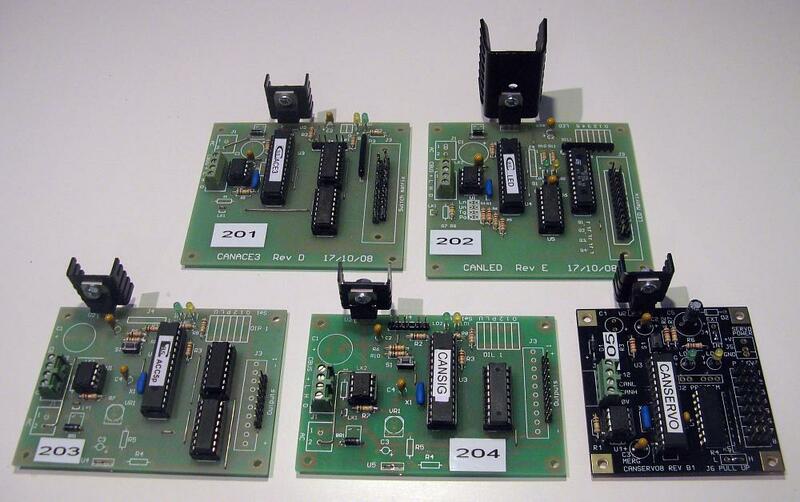 The CBUS system has a range of different boards available, and in our case they will initially be used for (electrical) switch actions and controlling point motors, LEDs, uncouplers and signals. More information on the MERG CBUS system can be found at the MERG website. The MERG CBUS boards for module two - which hosts the goods shed and yard tracks - constructed, tested and ready be to installed. The board labelled 201 is for detecting switch inputs on the control panel. Board 202 is for displaying LEDs on the control panel and elsewhere. Board 203 is for driving Tortoise point motors. Board 204 is for simple signal logic and driving signal aspects. Board 205 is for controlling servo motors for uncouplers. Suitable plugs and sockets for the electrical connections between modules have also been sourced. Our previous exhibition layouts have used PMG/Telecom (now Telstra) plugs and sockets, and while being able to handle the current and number of connections required, they were not designed for this particular task. For the higher-current circuits such as throttle and track power, circular aviation/military sockets will be mounted at each end of the modules. Jumper cables with matching plugs will then join the wiring between these sockets. 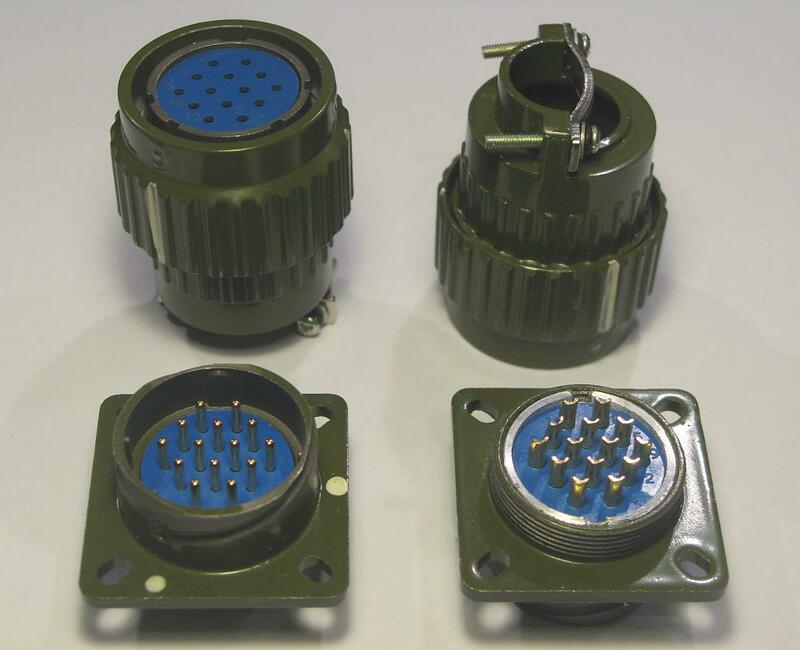 The circular aviation/military plugs and sockets that will be used for connecting the higher current circuits between modules. To mount the connectors, plates for each module end were made from a scrap length of 12mm ply left over from the module framework construction. For any low-current connections, such as the two-wire CAN bus for the CBUS system described above, RJ45 (also known as Ethernet or computer network) jacks and network leads will be used for connectivity. 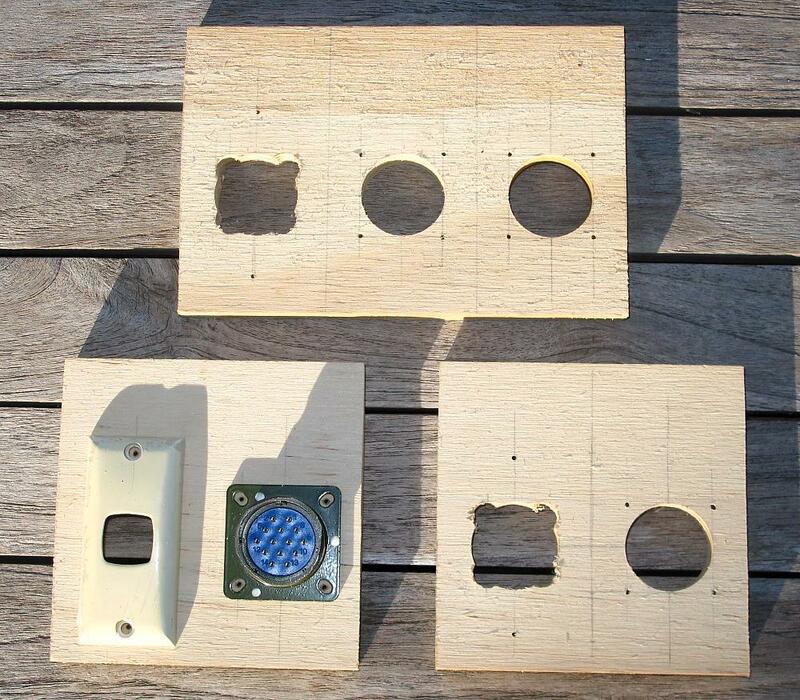 The RJ45 jacks will be inserted into one-gang architrave plates, which will then be screwed to the plywood plates. Plywood mounting plates for the electrical sockets on each module end, showing how the high-current and low-current circuits will be connected between modules. More higher-current connections are needed for the yard tracks traversing the joins between the end modules and the storage yard modules, so the plates for these module ends have space for two circular sockets. The plywood surrounding one of these sockets will be painted to differentiate it.